On my 1.5 hour (each way) commute to Sydney I pass the time by listening to podcasts. These podcasts range from personal finance, health, motivational and general interest. Personally, I find podcasts are an amazing source of information and a great way to utilise what would otherwise be wasted time. Recently I have been listening to a podcast by Nick Broadhurst. I urge you to check it out, it is a great listen. Nick runs a regular episode labelled "radical honesty", so I was inspired to do the same here. My thoughts are, how do I expect to gain the trust and openness of my readers without being truly open myself. So, today is step one to rectifying that, we are going to open up to you and be radically honest....our identities will be revealed! 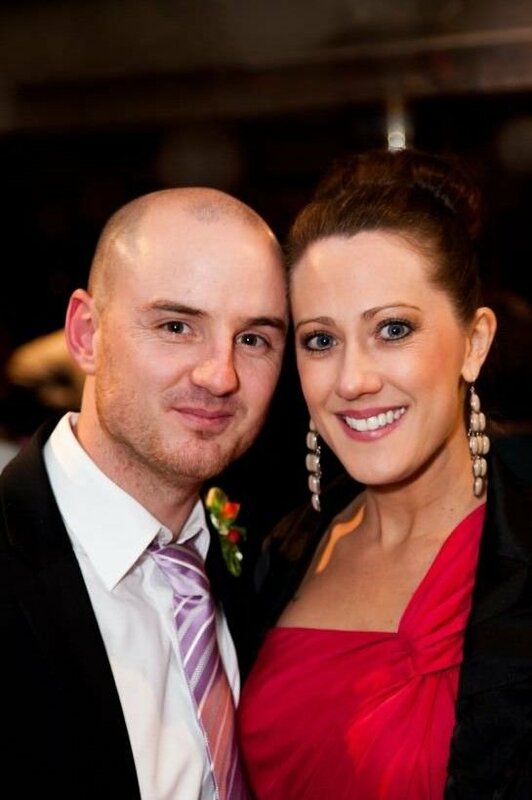 Hello, nice to meet you, my name is Jason (aka Mr 3000) and this is my beautiful wife Kylie (aka Mrs 3000). Here we are all dolled up as guests at a wedding. Kylie and I have been married for almost 8 years and we have been together for almost 10 years. We have an amazing son who is almost 5 years old, however we have chosen to keep his photo off the internet as much as possible. Kylie and I were married in Fiji back in 2010 in a beautiful small ceremony with close family. We purchased our first home in May 2011 on the Central Coast of NSW which is 1.5 hours north of Sydney. We paid $372,000 with a 15% deposit for this 1970's fixer upper and through lots of blood, sweat, tears and money we turned the house into a nice modern home. In addition to the DIY and renovations, we were also trying our best to pay down the mortgage as much as possible. We did a pretty good job of this, getting the mortgage down from $316,200 to approximately $270,000 in the space of 3 years. However if I had known about financial independence back then, we would shaved off a hell of a lot more. In early 2014, we decided to divide our block in half and allow Kylie's parents to build a granny flat (a really nice 100sqm one). As part of this arrangement, Kylie's parents kindly offered us $60,000 for the use of this land. So our mortgage was now around $210,000. This was technically a house hack, not that we knew it back then. I know the idea of living in close proximity to your parents/in-laws would make most people cringe and run for the hills. For us, it made sense due to the fact that Kylie is an only child and her parents have a large age gap with her father in his 80s and mother in her mid 60s, so we knew this type of living arrangement would happen eventually. In late 2015 we received an offer from my side of the family to buy into a block of land relatively cheaply. It was in a much nicer suburb and in a better location than where we were currently living, so we accepted the offer and put the home and granny flat up for sale. We sold in early 2016 and our plans were to use the proceeds of the house sale (plus a mortgage) to a build another house hack - a home and a nicer 120 sqm granny flat. Our interim plans were to rent for 12-18 month while we start building. However with numerous council delays, environmental reports, geo-technical reports, surveys, tradesman delays and professional service headaches etc we are 2.5 years in to the process are still renting. Paying $670.00 per week mind you, as we needed a large home to accommodate all of us and to allow us to have some sort of separation with the in-laws. So in summary this has been a bit of a nightmare, and an unnecessary stress on our life. However hopefully the nightmare ends in about 9 months or so when the building is finished. We will keep you posted. In 2017, I found financial independence through podcasts, most notably through "the minimalists" podcast. The concept of minimalism struck a cord with me and that lead me down the path, looking at further ways to improve our life and get back our time, simplify our life and slow down (which is all a work in progress). Through minimalism, I stumbled on FI and I was instantly hooked....this was a life super power. Living life just a bit smarter can change your future and get you off the consumption treadmill. So in late 2017 we decided to go "all-in" on FI and what a great decision it has been. We have jumped off the reckless spending treadmill and have started being mindful with our money and our lives in general. The proof is evident, we have gone from spending almost everything we earned to saving $2,000 to $3,000 per month and we now have $22,000 in savings in just 7 short months. In summary, we have started this blog to help others on their own journey. To do this we have to be radically honest with you. So no more hiding, from now on we will be 100% open with you. Part 2 of the radical honesty series we will dive deeper into our finances so you can get a clearer picture of how we spend our money. 3. If you do start a website and are looking at website builders, try out Site 123 it was super easy. You could easily start an online business or blog within 2 hours.